100% cotton, quilting, patchwork, craft and sewing fabric. Colours of blue and grey. Each little rosette has a dark red centre and the shape of the centre echoes out around the red. Rosettes are approximately 1.5cm across. 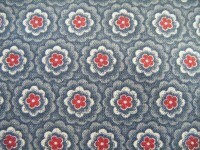 From Marcus Fabrics Judie Rothermel "Civil Ware Tribute Collection - 150 Year Anniversary"